"The next great villain from a galaxy far, far away is here. Fans attending Lucasfilm's Star Wars Rebels panel today at New York Comic Con got the world's first look at the Inquisitor, a black-clad, intimidating figure who will play a prominent role in the upcoming animated series. 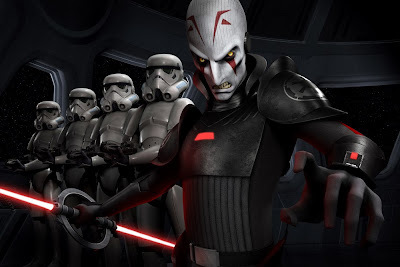 In a special video (available below) screened at the end of the panel, Star Wars Rebels executive producer Dave Filoni officially revealed the character, showing a sculpted maquette, design sketches, and disclosing that the Inquisitor is "tasked by Darth Vader to hunt down the remaining Jedi Knights.'" Be sure to read the full press release on Star Wars.com and check out the new behind the scenes video below. Keep it here for more details about Rebels coming soon! Hmm, seems like The Clone Wars Adventurers game has had a heads-up on this villain for quite some time. They've had the Sith Inquisitor, Infiltrator, and Marauder outfits for almost 2 years now. And if the above image is accurate, the Inquisitor outfit in CWA is just like that.